The latest KTM 125 SX engine is the most powerful and most competitive engine in its class; a clear statement that KTM is keen on keeping 2-stroke technology at the forefront of development. The secret to their success is an outstanding power-to-weight ratio, low costs and simplicity. This 125cc ripper has been developed with the latest KTM engineering know-how and the most advanced technology available. The results: class-leading power across the rev range, while being extremely compact and ultra-light at a mere 39.5 pounds. Our work here is done; now it’s up to you to collect the trophies. This compact cylinder with a 54mm bore features a cutting-edge power valve unit with a sophisticated mechanism for the lateral support exhaust ports. Matched to a twin-component cylinder head, it is KTM’s secret to all-round grunt. The layout of the water jackets in the cylinder and head guarantees efficient heat dissipation when the going gets tough. 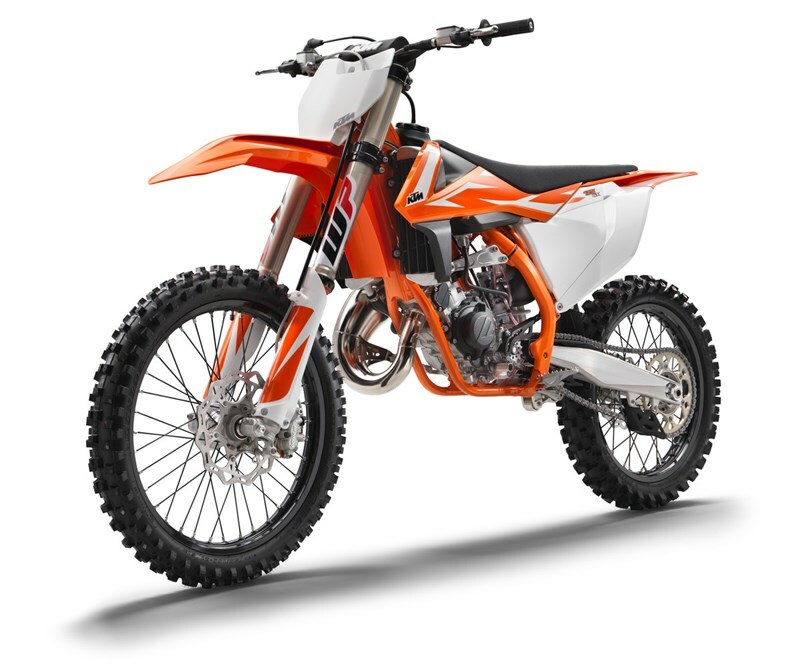 For the latest engine generation the KTM engineers designed lightweight die-cast engine cases featuring a high crankshaft position located close to the center of gravity, which results in optimal mass centralization and outstanding rideability. A robust 6-speed transmission was designed specifically for the small 2-stroke engine, its gear ratios are perfectly in sync with the 125’s power band. The latest production technologies allow for compact dimensions and minimal weight. An advanced ´No Dirt´gear lever design prevents mud from clogging the folding tip for reliable shifts even in the worst conditions. This reliable piece of engineering has been skillfully balanced to guarantee minimal vibrations. In its latest form, it allows an increase of the displacement to 144cc just by replacing cylinder, piston and head. There’s no longer the need to change the crankshaft if you want to change displacement. Two-in-one in no time. The KTM 125 SX is fitted with a MIKUNI TMX carburetor. This 38mm flat slide carb lives to provide smooth and controllable power all the way up to the rev limitation. With a new intake manifold the carburetor is turned 7° in order to reduce the overflow of fuel. And it’s less sensitive to different altitudes and temperatures, so you can pin it wherever, whenever. The engineers meticulously tuned the expansion chamber for maximum torque and power, so this screamer is as tough as it is strong. The high-tech, lightweight chrome-moly steel frame has a knack for easy handling, outlandish rideability, precise cornering and excellent stability. You can also count on high torsional rigidity and low longitudinal stiffness. This results in better absorption of the energy created from the front and rear suspension, sucking up jumps and bumps. In short: more comfort and less rider fatigue. Laterally attached, engine head stays (the connection between cylinder head and frame) are now made of lightweight aluminum. They contribute to more precise cornering and a reduced vibration level. The engineers were able to pull off all that, while making their frame 2.2 pounds lighter than that of the lightest competitor on the market. In addition, it is easier to maintain, easier to work on and supplies more space for the tank and other components. The bike also features an extra-light subframe made of aluminum, which tips the scales at less than 2 pounds. The airbox design offers maximum protection of the air filter while ensuring maximum airflow. The large twin-air filter is mounted in a stiff cage, which at the same time holds the system in place. This design is so simple you could still pop a fresh one in with a face full of mud. Without tools. In seconds. KTM’s proven cooling system routes the coolant from the cylinder head through the frame triangle, directly to aluminum radiators made by WP. A new filler cap system and are stiffer alloy construction increase the durability and reliability of the cooling system. Due to flow optimized internal circulation and CFD-calculated air ventilation, the system is superbly efficient. In addition, well thought-out radiator guards integrated in the front part of the shrouds provide protection in a crash.